Do you shop at Old Navy and you have a Visa card? Then you can a 10% discount any time you shop there from now until April 15! Print this coupon from Visaperks.ca and tuck it in your purse or diaper bag! 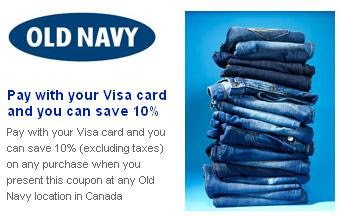 With the coupon, you can get 10% off on any purchase when you present this coupon and pay with your Visa card at any Old Navy location in Canada from now until April 15, 2010. The coupon is good for one time use only and must be redeemed at time of purchase, but it doesn't say that you can't print the coupon more than once! The only thing that's not clear is whether or not it applies to sale merchandise. If you are a big fan of Old Navy, you probably already know about Old Navy Weekly, the store's weekly coupon site, where you have to "hunt" for coupons. I suppose that can be fun but personally I have no interest in hunting for coupons like that. Well luckily we have other deal-seeking bloggers such as SmartCanucks.ca that have done all the legwork! $10 off $50: Click on yellow shirt and then jeans below it. $5 off $25: Click on the pink striped shirt then jeans below. When Eva’s face appears in the circle click on shirt and jeans again and then click on Eva’s face. 15% off: Click on blue tank and then jeans below it. Then click on Amy’s face. 10% off: Click on the blue tank and then jeans below it. I don't believe you can use the VisaPerks coupon with these coupons for the same purchase. But remember the VisaPerks coupon is good until April 15, 2010! 0 Response to "10% Off Old Navy Canada When You Pay by Visa; Old Navy Weekly Coupons"